That’s part of what Ben Hartman wrote as an introduction to his soon-to-be published book on lean farming. 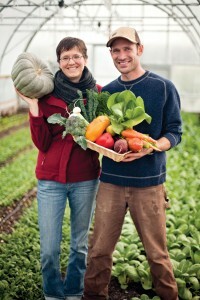 Adoption of the lean production model for their own farm, Clay Bottom Farm, is the result of Ben and his wife Rachel Hershberger experimenting with a variety of production methods, some more successful than others, but often lacking the continuity that would help them achieve year-round return. Their lean production model is the result of a CSA customer who talked with Ben and Rachel about how lean principles would benefit their farm. The couple realized the concept made sense for their operation. Today, they’re year-round growers, harvesting greens and vegetables from 9,000 square feet of greenhouse space, and making a living doing it. Growing greens and produce in the lean model requires careful forecasting of what customers want. “The worst form of waste on our farm is overproduction,” said Ben. “There’s nothing worse than growing a crop, harvesting and washing it, then not having a market for it. We carefully forecast and grow the amount customers will want.” In addition to the 60-share CSA, Clay Bottom Farm currently sells fresh produce and greens to six local restaurants, a grocery and at a farmers market. During the first few of years of growing, Ben and Rachel focused on getting their product out and letting people know what they had. “Once people knew what we had and the business gained some traction, we did a lot of listening,” said Ben. Two greenhouses are heated through winter to a temperature of 30 degrees, which is enough to keep most greens crops alive. Crops are seeded directly on the ground and grown with organic practices as Clay Bottom Farm transitions to organic certification. “There’s something growing in the greenhouses year-round to maximize fixed costs,” said Ben. “We try to keep them full all year. The greenhouses act as above-ground root cellars to keep crops alive.” Clay Bottom Farm also produces numerous crops grown outdoors through the usual growing season. Ben says their main pest issue is flea beetles on summer kale grown outside. “We’ve seen them on just any type of the Asian greens like Mizuna, pak choi,” said Ben. “The solution is timing — planting the sensitive crops before or after flea beetle season.” Ben is currently working on screening one greenhouse with insect mesh that will prevent entry.